The origins of this great white dessert wine are in a rigorous selection of the rare Vespaiolo, Tocai and Garganega grapes, which are hand-picked and placed in little trays, weighed and withered in the sun until January. The wine passes eighteen months in French oak barrels, a third of which are new, and then six months in the bottles. 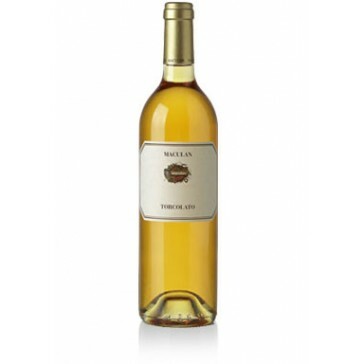 It is a brilliant, golden straw-yellow colour and has a bouquet that has a strong hint of honey, apricot, flowers, vanilla and wood. Its sweet, full taste is due to an excellent balance between acidity, alcohol and sugar, and lingers in the mouth. The Maculan family has been operating as rural wine-makers in Breganze for generations. Breganze is situated in hilly foothills to the north of Venice. The mountains protect it from cold winds and over the course of centuries the Adriatic sea has deposited white gravel that has made the land looser and more permeable. The climate is mild and there are many olive vines. Noble Venetians used to chose this area to pass the hot summer months in famous villas designed by Andrea Palladio. The Maculan family have several different vineyards on these hills, which are morainic and volcanic in origin, an ideal environment for the cultivation of vines. The method of cultivation produces a limited yield, yet when combined with the quality of the vines, which include the rare Vespaiolo, and the land itself, leads to wines of an elevated quality. In the company's cellars, which are situated in the historic centre of Breganze achieve an amazing unity of ancient traditions and present-day techniques. Everything that is part of tradition is respected: the accurate choice of the bunches of grapes; the conservation of the grapes in attics; wine-making according to the requirements of various species of grapevines; and ageing in small oak barrels in underground cellars. This wine goes well with pastries and fruit tart, but also with soft cheeses such as Roquefort and Gorgonzola. In order to get the full effect of this wine's aroma it is recommended to open the bottle two or three hours before serving. It should be served at 10 - 15 degrees centigrade. The best glasses to use are clear, transparent crystal goblets.